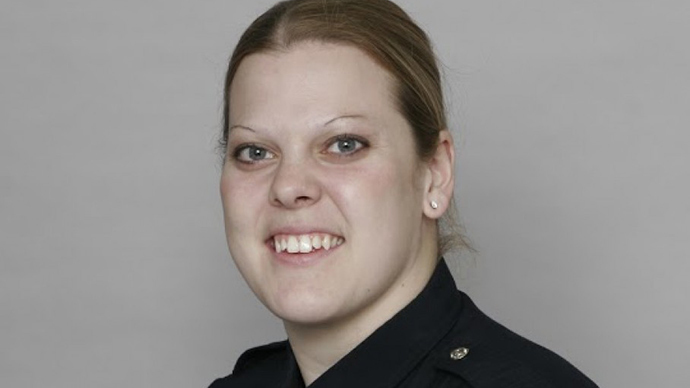 An officer with the Omaha Police Department is dead following a shootout with a suspect a day before her newborn daughter was scheduled to be released from a Nebraska hospital. Kerrie Orozco, 29, died on Wednesday after being involved in an altercation with a suspect that afternoon in north Omaha. Orozco’s daughter, Olivia Ruth, was born premature in February and has been in the Newborn Intensive Care Unit of the Nebraska Medical Center ever since. She was expected to come home Thursday, and turn three months old on Sunday. On Wednesday evening, Omaha Police Chief Todd Schmaderer announced that Orozco had died as a result of a shootout that unfolded just before 1 p.m. while she was attempting to serve an arrest warrant on suspect Marcus Wheeler, 26. "This is a somber day for the City of Omaha," Schmaderer said, according to a local NBC News affiliate. "Kerrie Orozco has died after being shot in the line of duty." Orozco had put off taking time away from the force while waiting for her daughter to be released from the ICU and was also scheduled to start maternity leave on Thursday. Members of the OPD Fugitive Task Force, including Orozco, were serving a felony arrest warrant for Wheeler on Wednesday that gave way to a shootout, according authorities. Orozco and Wheeler were each struck during the exchange, and the two were taken in separate ambulances to Creighton University Medical Center. "I heard shots fired and when I heard shots fired, I ran down inside to my basement,” neighborhood resident Tiffany Atkins told WOWT News. Wheeler, who was wanted on a warrant stemming from a previous shooting, also died Wednesday, officials said. Chief Schmaderer described him as a “convicted felon and a known gang member” and a handgun was reportedly recovered from him before he was brought to the hospital. Today's tragic news is devastating to the law enforcement community and all Nebraskans. "We must all ensure that Officer Orozco's sacrifice will never be forgotten,” Gov. Ricketts said. According to the Associated Press, Orozco was the first Omaha police officer to be killed in the line of duty since September 2003. The National Law Enforcement Officers Memorial Fund says an average of 146 cops a year have died as a result of their work during the last decade, and that 117 law enforcement officers were killed in the line of duty in 2014, including four women. Orozco had been with the OPD for seven years, according to Schmaderer, and is survived by her husband and two stepchildren, ages eight and six. The Officer Down Memorial Page reports that her passing marks the 12th time in 2015 that an officer has been killed on the job.